William Brookes Sixth Form is a successful and positive environment where students are able to enjoy learning as well as participating in a wide range of extra-curricular activities. Benefiting from a contemporary building with excellent facilities and a close-knit and supportive community, we aim to provide the best educational experience we possibly can. Students are taught in small groups where independent learning is encouraged and support is readily available from a team of dedicated Sixth Form staff. We have a proven track record of enabling students access to Oxbridge and Russell Group Universities, and our academic credentials speak volumes, with nearly 20% of our grades being at A* or A. Actively promoting and supporting an extensive range of career opportunities is also an important part of our agenda, and next year we have a total of 23 A-Level courses available as well as BTEC PE. At William Brookes we hope all students leaving Sixth Form will have developed not only their academic ability but their personal and social skills as well. Due to our diverse range of opportunities, we are sure, as a student here, you will be able to find something on offer that will both enhance and complement your learning experience as well as your extra-curricular aspirations. 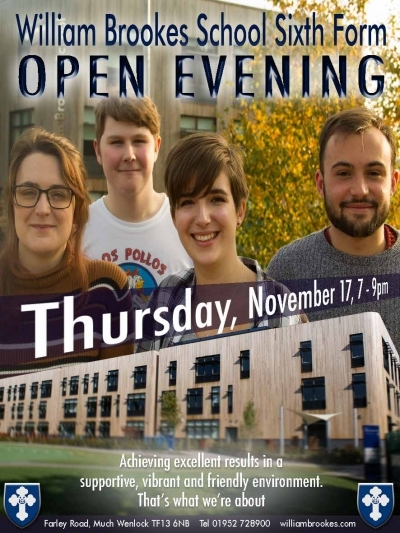 Our Open Evening starts 7pm - Thursday, 17th November. Come and join us; meet our current students and have an enjoyable and informative evening. We’re sure you’ll find lots of reasons to come back and join us for good.